Two years ago I was out on a bike ride and I found small, abandoned folding bike on a sidewalk in South Norwalk. I figured out how to attach it to the side of the bike I was riding and carried it 13 miles to get it home - where I nursed it back to health - eventually adding a DIYBIKING.COM sticker to the blank top tube. I began using it, but quickly realized I wanted a bigger chainring and crank arms that were less stubby, so about a year and a half ago I went ahead and changed the bottom bracket from a Saved from the Scrapheap bike, which was tricky but successful operation. When I welded a homemade tow package to the bike, I found I could use it to transport bicycles short distances and have a way to get back home - such as my Free to a Good Home - in Cleveland trip that brought me to the Ohio City Bicycle Co-Op. Even without the rack - or when I wasn't using it - I found myself using the bike quite often - usually for trips when I wanted to ride but didn't want to have to lock a large bike someplace. It's small size also gets it on board Amtrak easily, which is why the bike went with me to the League of American Bicyclists 2014 National Bike Summit this past winter - where the bike stood up to an incredible amount of Hoth-like abuse. And who can forget the bike's role helping Bike Walk Connecticut promote a successful Bike to Work Day Event in Stamford? Just the sight of Lorca makes me want an alfajore cookie. Eagle-eyed readers will notice subtle changes to the bike over time. I replaced the handgrips, seat, tires, both wheels, chain, the chainring, brake cables, brake levers and the front and rear brakes. I knew it would never be a disposable bike or something I'd turn into a sculpture, but I didn't expect it to carve out a respectable place in my life. Today, the newest change is the wonderfully loud bell I bought for 100 Rupees ($1.66 U.S.) during my Delhi and Gurgaon adventure earlier this year. But over time it began to bother me that I've never seen another bike like it - anywhere. So I decided I needed to find out where the bike came from. So I started looking online. The 14" wheel size was a distinguishing characteristic so I used that for a lot of the Google searches hoping to find a match. I emailed Michael Embacher, the famed bicycle collector in Vienna who is responsible for the great coffee table book Cyclepedia (also an app, of course) but haven't (yet) heard back. A search for the serial number gave me nothing. Posting on a bike forum also gave me nothing. A visit to foldingcyclist.com also didn't get me closer to the origins of my ride, but I did get to learn quite a lot from them about the long history of folding bikes. Some of the searches of South Norwalk's partial or complete serial number (which starts with the letters: KD) brought me to truly odd results, such as the Canadian Police Information Center, which briefly made me wonder if South Norwalk was a fugitive from the Canadian government. But that was a dead end, too. 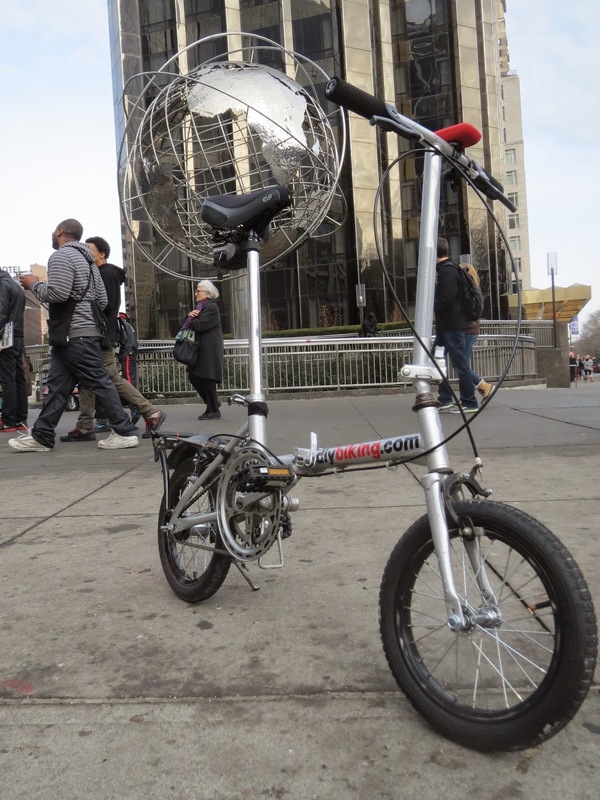 Even though I finally found a folding bike that had 14" wheels, SoloRock, at Bike Expo New York, I knew it wasn't related to my ride. Rolling through the pictures, I came to find someone selling what looked to be an identical bike (two days left on that auction, if you're interested). Even comes with a bag to carry it in. And on the top tube the words "Roll N Fold" appear. A few more searches of that term brought me a couple of more online classified ads for identical bikes. That clinched it. "You have brothers and sisters," I said to South Norwalk, which was sitting in my home office at the time. Even though I found the name of the bike…the search quickly went cold again. From what I could find, 'Roll N Fold' had been an 'abandoned' trademark for more than a dozen years, and the trademark had been (or, possibly, still is) owned by T.V. Products USA Inc. This made me wonder if my bike was once the star of a television informercial: some cheery woman with perfect teeth pulling out a bike and riding it off only for Ron Popeil to tell her: "You're not going to pay $100 for my product." And a guy watching at home, slouched on a couch in a dark living room, smearing peanut butter on Cheetos*, looks at the TV and thinks: "That's what my life needs. 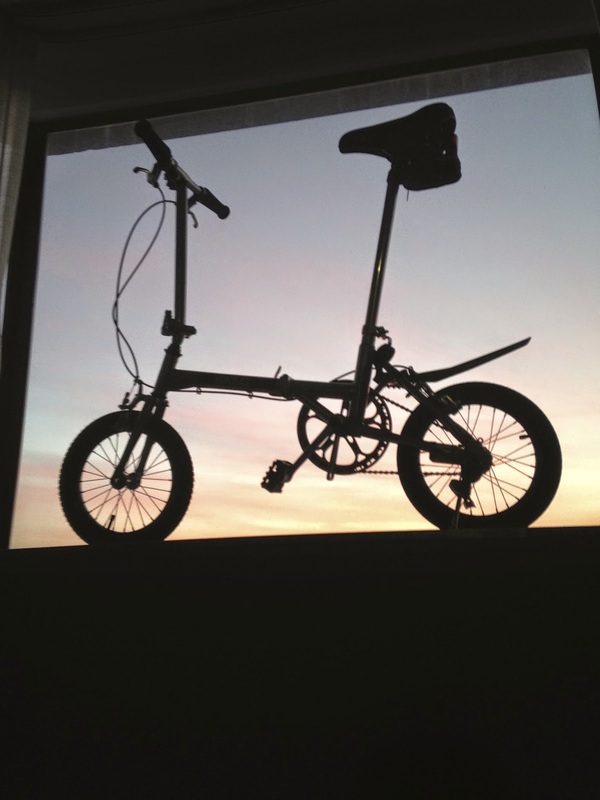 A folding bike." Eventually, I got an email reply from foldingcyclist.com: someone had sent him a photo of a Roll N Fold some years earlier and notes suggested the bike was bought at an RV dealership. The person who contacted me speculated the bike may have been imported from Asia and sold through RV dealerships or RV magazines. But anyway: I couldn't find anything more. But I did find out South Norwalk's name: Roll N Fold. 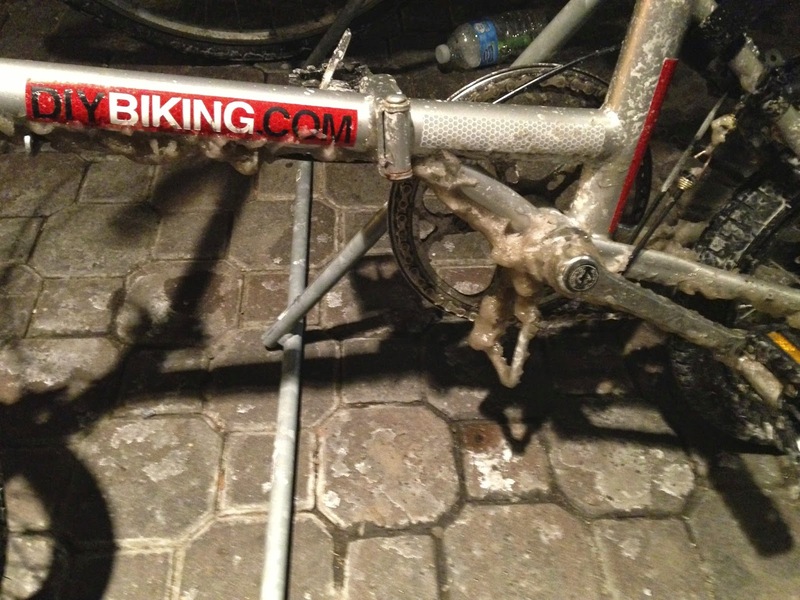 It's a cheap folding bike that actually, in my opinion, works very well…after swapping every component but the frame. From here on out, I am still going to refer to that bike as South Norwalk. There is precedence, here: when you found out the name of the Cigarette Smoking Man in The X-Files he was still the Cigarette Smoking Man, wasn't he? Whatever the name is on your folding bike: enjoy your ride. *I've never tried that. I don't think anyone should. Not so much the taste but the tensile strength of the Cheeto couldn't support…never mind. The frame looks suspiciously like a panasonic traincle. Only the panasonic traincle is made of titanium. bikes based on the same frame are sold as Fiat FDB140, oyama, javafold, etc.